Occupation authorities restarted work of the checkpoint at the administrative border with the annexed Crimea in the morning on November 1, but the speed of cross-border registration was very low. This was reported by the assistant head of the State Border Guard Service Oleh Slobodyan on air of 112 Ukraine TV channel. 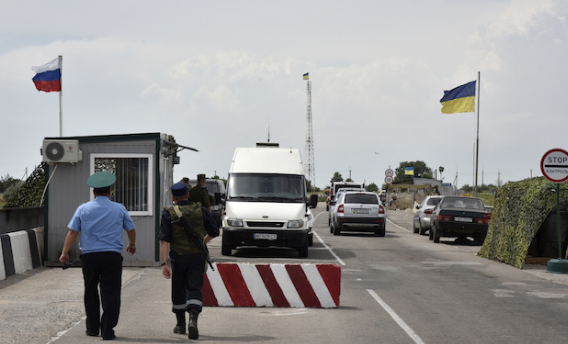 "Yesterday, from 1:00 to 10:30, the occupants did not let through both cars and pedestrians at the administrative border with the temporarily occupied Crimea. At about 10:30 they opened the checkpoint, although the speed of registration was quite low," he said. As it was reported earlier occupants of the annexed Crimea fully shut down the traffic across the administrative border with Ukraine. The country’s State Border Guard reported this on Wednesday. Due to this situation and the respective circumstances that took place at Chongar, Kalanchak and Chaplynka, the Ukrainian authority asked the citizens to refrain from traveling to Crimea. Russia's FSB Border Guard reported that the traffic shutdown took place for ‘technical reasons’. Interfax, the Russian news agency, added that as of Wednesday morning, the traffic was restored.